To many foodies, Marc Forgione is a name synonymous with Michelin star chef and winner of the 2010 Iron Chef challenge. To me, the name evokes rather a cozy, rustic neighborhood restaurant, perfect for romantic dates and casual reunions with friends. After having eaten dinner there a few times as well as brunch, I also do not disagree with all the more formal accolades that Marc Forgione (chef and restaurant) has garnered. Situated on a quiet street in the heart of Tribeca, Marc Forgione (formerly known as the chef’s nickname “Forge”) emits a warm, inviting glow that beckons the casual wanderer of the streets of the neighborhood. The decor inside was meticulously chosen to conjure the feel of rustic Americana. The building itself used to be a butter warehouse (most of the buildings in Tribeca used to be warehouses for that matter). The wood used throughout the restaurant comes from Chris Blumlo’s (Managing Partner’s) family sawmill in upstate New York. The oven is a Glenwood Model C from the late 1800’s. It has been refurbished and is used to warm the bread (which is amazing, by the way). Many other artifacts– pepper mill, sausage stuffer — are generations old Forgione and Blumlo family possessions. The books on the shelves above the dining tables came from the James Beard collection and were donated to Marc’s father, Larry (another renowned chef) after Beard’s death in 1985. The son of the famous chef Larry Forgione, Marc got an early start in the kitchen. After graduating from the School of Hotel and Restaurant Management the University of Massachusetts at Amherst, he worked at several NYC restaurants and then spent some time working in France, refining his culinary skills. 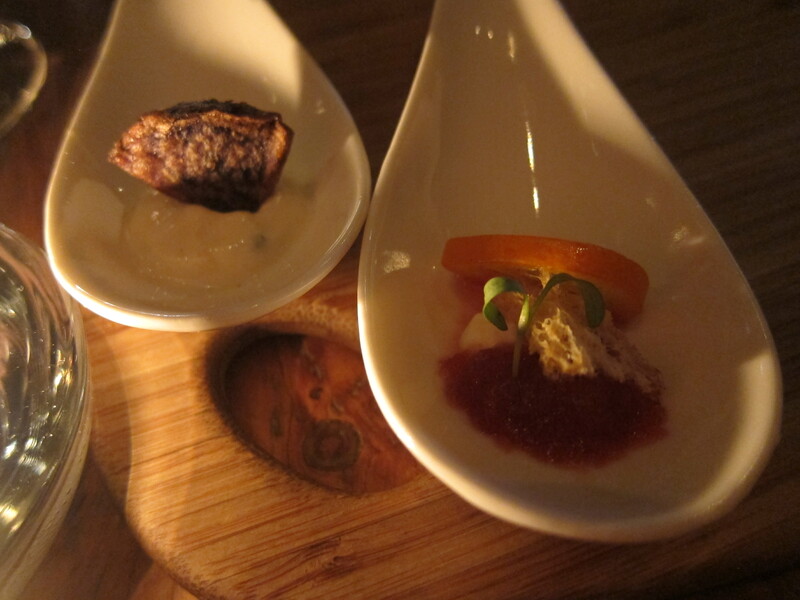 Once back in the New York scene, he returned to BLT Prime where he was previously a sous chef, now as chef de cuisine. As time went on, Forgione became the corporate chef for the BLT empire and was instrumental in growing the franchise in cities throughout the United States. 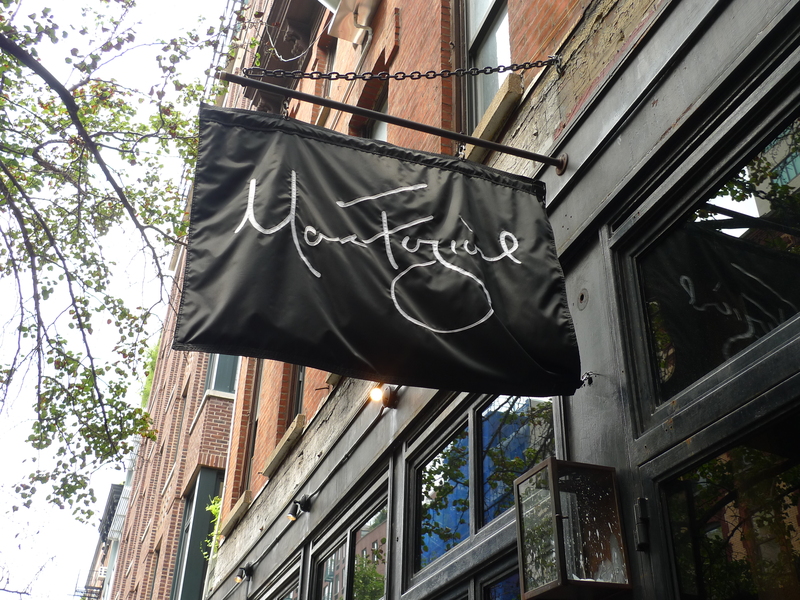 Finally in June 2008, Marc Forgione opened his eponymous restaurant. He and his partner Chris Blumlo created a cozy oasis amidst the traffic and hum hum of downtown New York where they serve New American fare that showcases Forgione’s years of experience working at home and abroad. So without further ado, here is what we degusted. 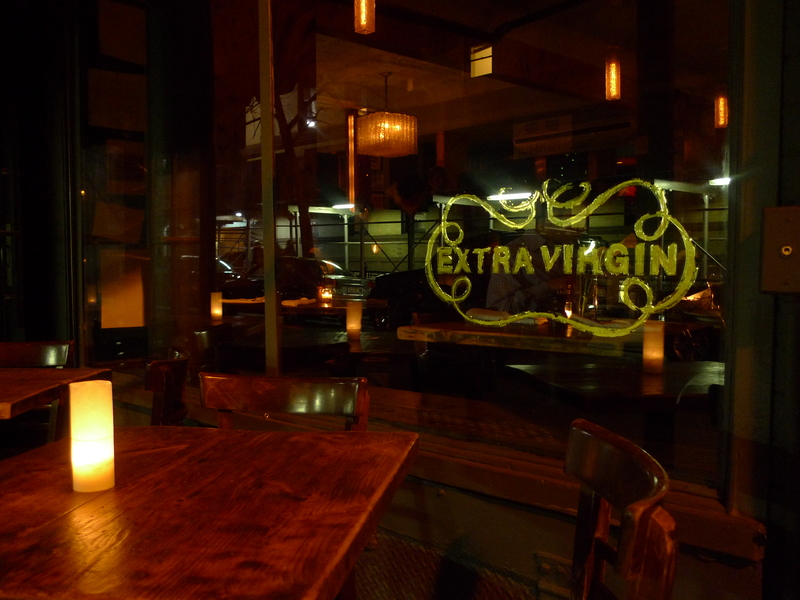 The wine list at Marc Forgione is not extensive, but does showcase a good number of US and international wines. It even pays homage to the legendary winemaker Robert Mondavi, featuring his Reserve Cabernet (unfortunately slightly out of my budget). 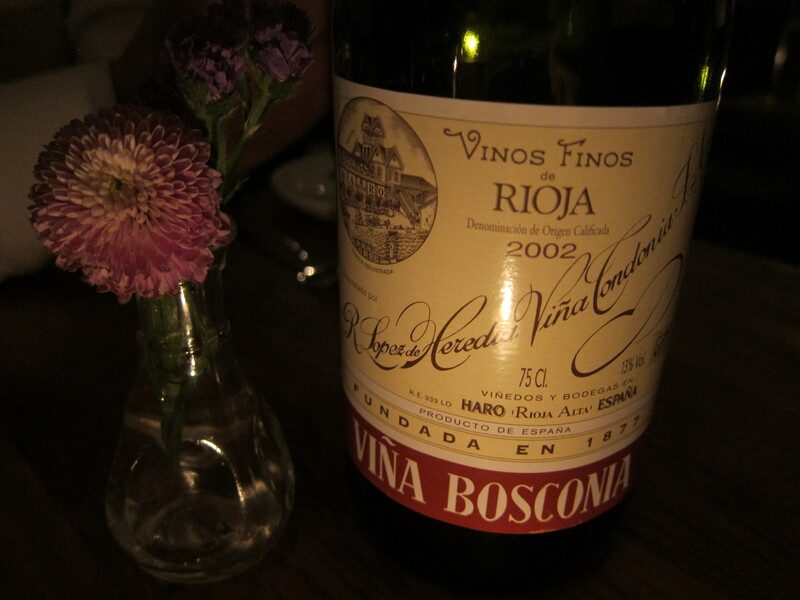 My friend and I split a bottle of Rioja and did not regret it. I believe it was recommended by our server and was a good complement to the savory appetizers and hearty entrées we ordered. I had to order this because of the eclectic combination of ingredients and the kumquat infused tequila. Loved the understated sweetness of the kaffir lime and the freshness of the mint. As mentioned above, the bread is warmed in a 19th century oven. While I did not know this piece of trivia when I was eating at the restaurant, I gobbled down the little bun in a second. 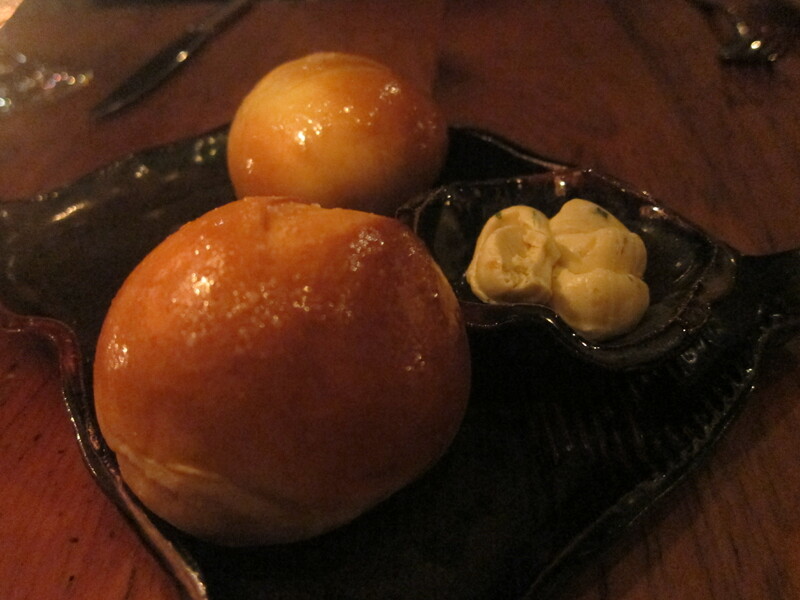 It was just so warm and soft and that buttery sheen just beckoned to me. These were very amuse-ing, the little bite tempting you just enough to get a taste and wish for more. Freakin’ awesome idea to stuff the quail with another fowl, reminiscent of a more chic Turducken. The raisins and currants added some sweet and tangy flavors while the creamy chanterelle sauce added a smooth savory finish to the dish. 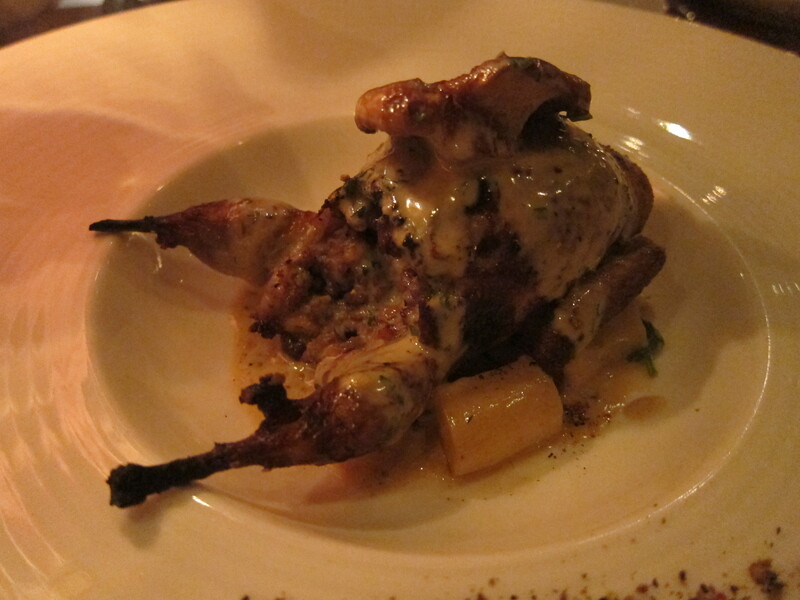 Great appetizer, but my favorite take on quail is still at L’Artusi. 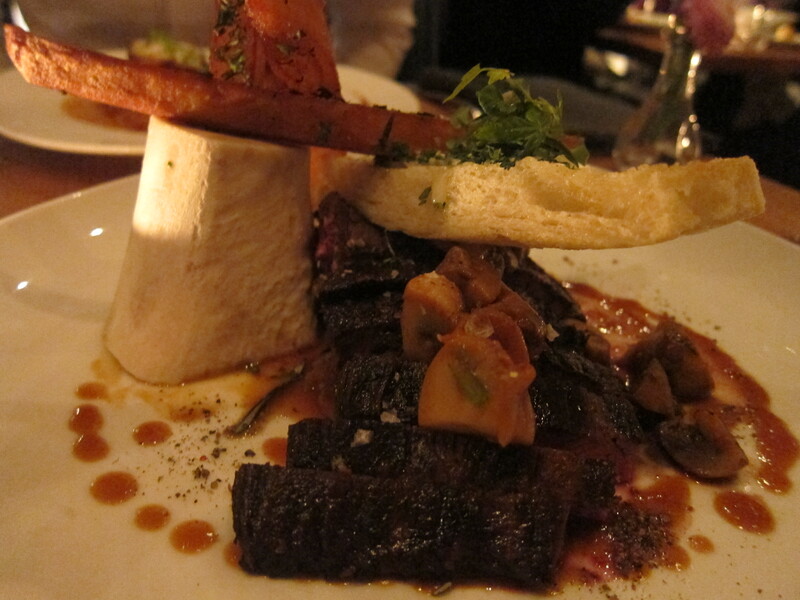 Oh man, this dish was ridiculous, I don’t even know where to begin. 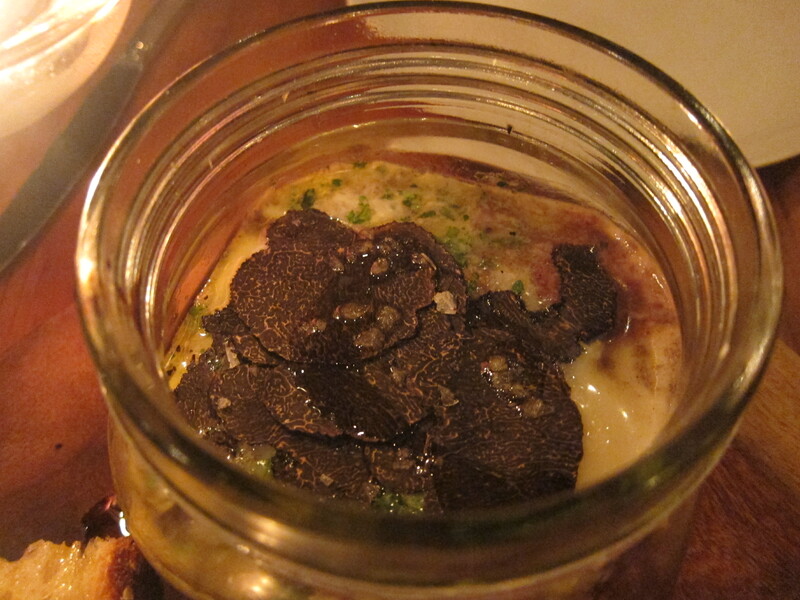 The ingredients reminded me of a similar egg/truffle dish at Eleven Madison Avenue. The cheesy crostini were perfectly crispy. 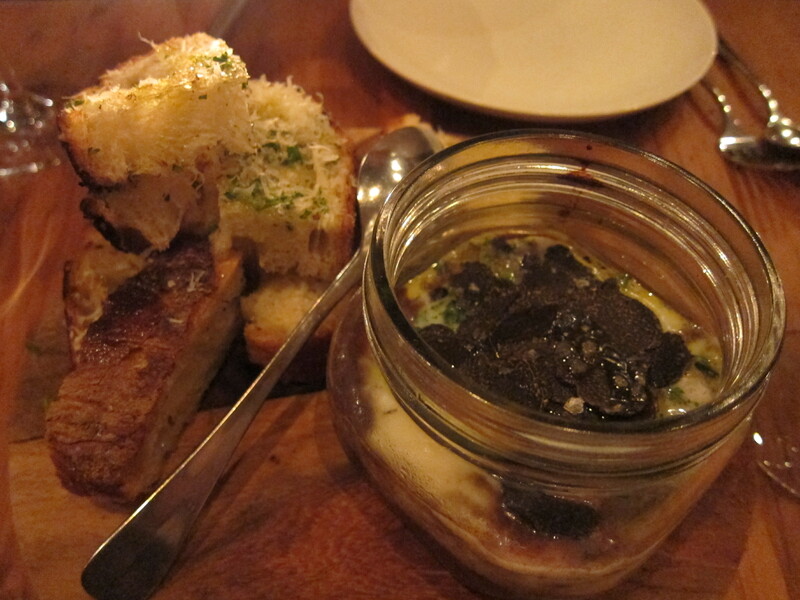 The farm egg oh-so-savory and you cannot go wrong with black truffle flakes. Steak was made medium-rare and was juicy and melt-in-your mouth fantastic. Bone marrow fries. Fries dipped in bone marrow. Nuff said. After the pretty heavy set of appetizers and steak, this fish dish was a nice lighter part of the meal. 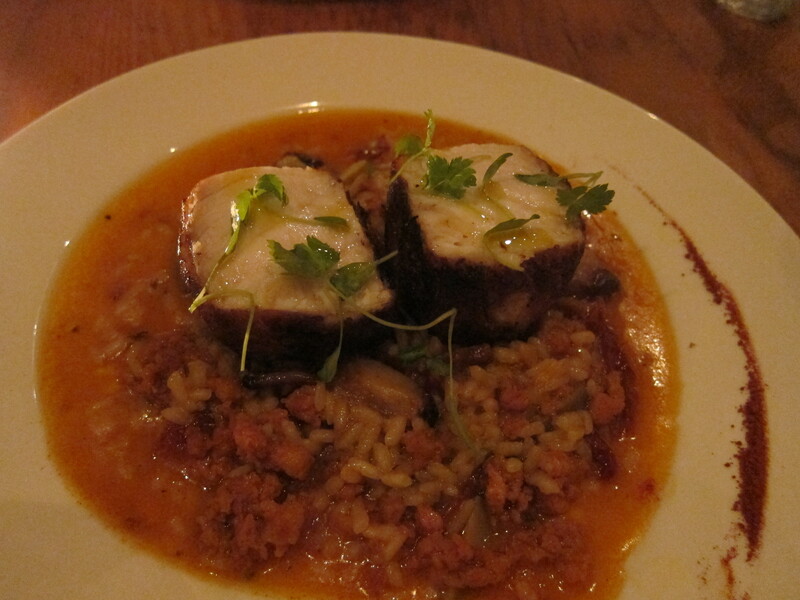 I should say “lighter” because it was essentially a hearty risotto with bits of chorizo with fish on the side. I enjoyed the Mediterranean/Spanish undertones of this fish preparation. After all that, it is no surprise that we had no room for dessert, so maybe next time as the list looked delicious! mhm truffles.. and that stuffed quail sounds amazing!